Buffy the Vampire Slayer Complete Series Tin. 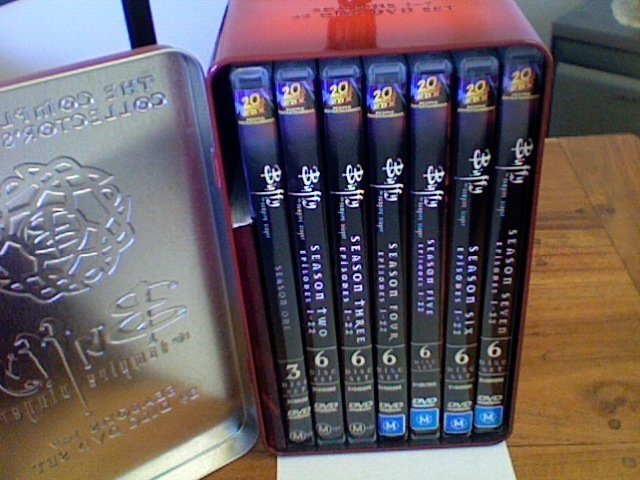 These are some crappy quality pictures of the complete series set I bought taken using picha booth. This is a set of all seven seasons, housed in a metal case.. Wallpaper and background images in the Buffy the Vampire Slayer club tagged: buffy tin seasons red shiny. coolio! I have all the seasons seperatly bought! But right before the DVD case of SEASON ONE, what is that little card deck thing? IS that the Tarot Card Deck? Sarah & David - Friendship au something zaidi ? ~ BTS of the most emotional TV couple of all time!